These forty-four short yet hard-hitting readings cover such themes as purity, perseverance, loyalty, and forgiveness--all from a teen-centric viewpoint. 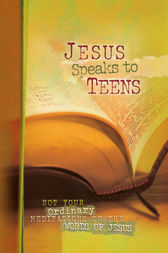 Drawing speci?cally from the words of Jesus, each reading offers back story for the biblical passage, how Jesus' words apply to teens today, and additional Scriptures and inspirational quotes to reinforce the point. Perfect for birthdays, Easter baskets, graduation--or a gift "just because."